This tailors' sample quilt was the first quilt Lila Myrtle Harvey made. It was made in 1947 at Lake grace Western Australia. It is now owned by Joyce Lannin, Lila's daughter. It is still used. Lila Myrtle Harvey: "When a small child Lila spent her early years in South Australia with her Aunties who spent hours doing patch work and Lila was fascinated with the colours and results of their work. So much so that she always had a hankering to do patchwork herself. But she lived a very busy life and it was not until after her own children had grown up that she was able to indulge in her dream. Her first quilt was made from tailors samples which were destined for the rubbish and which she saved. With these she made a very serviceable rug which has seen many years of service in her family. All her life Lila has been busy making clothes for her family and has kept the pieces left over from her sewing. As soon as she had spare time when her family had less need of her full attention she started making hexagon templates and covering them with pieces from her scrap box. These she joined into flowers which she joined together to make her first quilt. 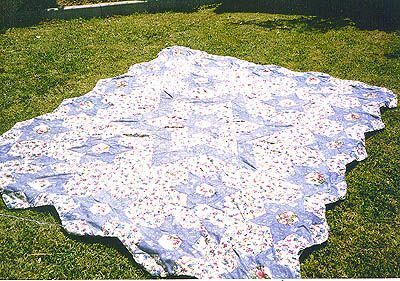 Many years later after hours of hand sewing her first quilt top was finished making a masterpiece of beauty. It stayed on her bed until she passed away when it was handed on to her daughter who has since passed away and the quilt now belongs to her first grand-daughter Debbie Rendell. A neighbour of Lila's had a quilt made in Log Cabin design and gave Lila a square as a pattern so Lila sat at her machine for months making Log Cabin squares until she had enough squares to make her quilt. Each square is made of different materials and colours. The final result is a very lovely [quilt] which is now owned and used by her daughter Joyce Lannin in Lake Grace. Besides these quilts Lila made quilts for her grand-daughters and many cushions for her children. After she passed away her unfinished pieces were incorporated into patchwork quilts and articles by her daughter.